One indicator often used to gauge the market’s health is looking at the number of advancing stocks versus the number of declining ones. This indicator of market breadth measures the difference of how many stocks are going up on a daily basis compared to the number of stocks falling. In rising stock markets the indicator suggests that the uptrend is still in place. If the market is still going up but more individual securities are falling rather than rising, this can by an early indicator that the trend may be turning. 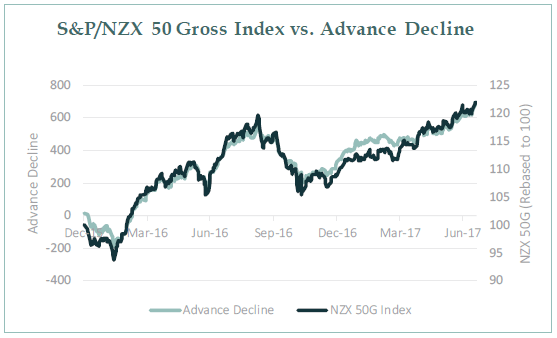 Looking at the S&P/NZX 50 Gross Index versus market breadth since the end of 2015, the advance-decline line has closely tracked the stock market higher. While it is but one indicator to be considered, one can see that the trend remains positive and the market rally is across most stocks. The inference being that the market is healthy and there is a continued uptrend in place. 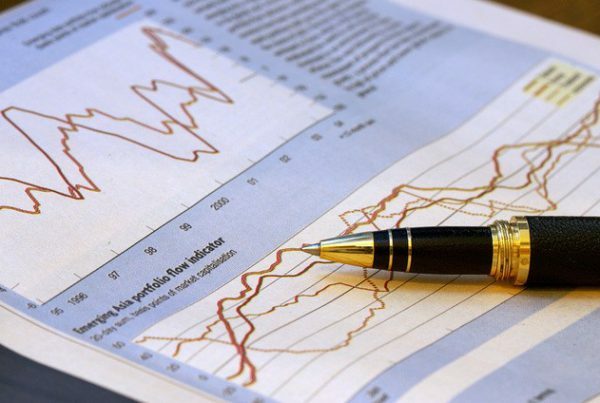 Hobson Wealth Partners Limited (FSP29782), is an NZX Trading and Advising Participant, an Individual Clearing and Depository Participant, as well as a registered financial services provider (L17, 88 Shortland Street, Auckland, New Zealand). The disclosure statements for Hobson Wealth and your adviser are available free of charge by contacting us on 0800 742 737. The information on this website is a general description of the Hobson Wealth or its services only. Before acting on any information, you should consider the appropriateness of it having regard to your particular objectives, financial situation and needs and seek advice. No information set out above constitutes advice, an invitation, an offer or a solicitation, to buy or sell any financial product or security or to engage in any investment activity, or an offer of any financial service. Some products and/or services mentioned on this website may not be suitable for you and may not be available in all jurisdictions. © 2019 Hobson Wealth Partners.